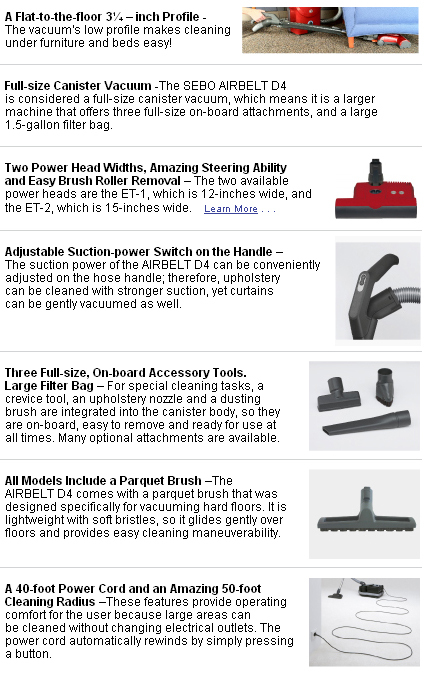 The AIRBELT D4 is a powerful, fullsized canister vacuum, which features three onboard attachments, variable suction control, rubber-coated wheels to protect floor surfaces, quick-release connections, a full bag or clog indicator, and a soft bumper to protect the vacuum, furniture and walls from scuffs and scratches. Two sizes of its commercial-quality power head are offered, along with a durable telescopic tube featuring an internal power cord. An ergonomically designed handle provides user comfort and smooth maneuverability. 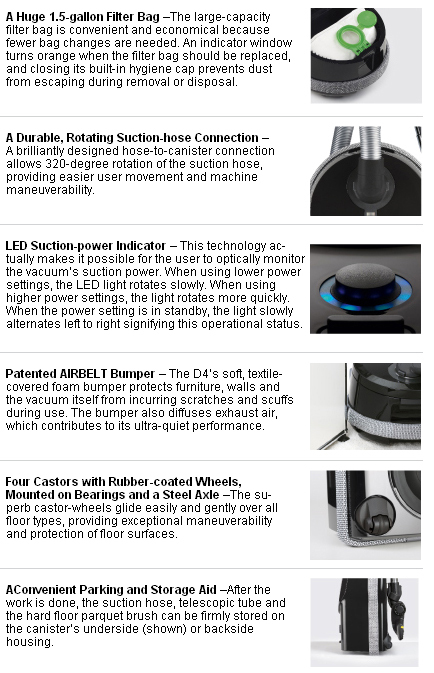 The D4‘s "suction-optimized" airflow pathway, together with a one-of-a-kind tapered hose, provides ultra-quiet operation and amazing suction power, and its long-lasting motor life is further extended by a “soft-start” switch. Save Money! SEBO's Last for Years and Extend Carpet Life! Water Lift (motor rating): 95 in. Cord Length/Range: 40 ft./50 ft.
Power Head Width: 11 ¾ -14 ¾ in.